College basketball generally has its fun on Saturdays, leaving only a few match-ups on Sundays for us junkies to wet our beaks with. 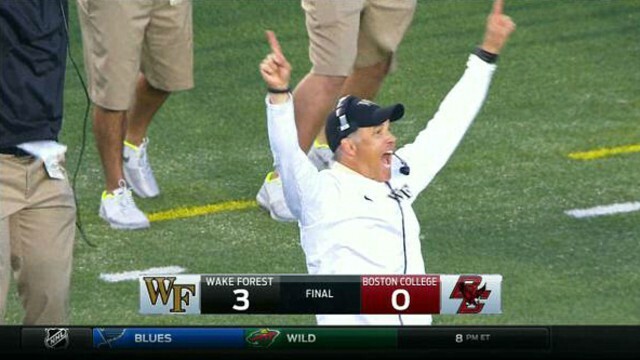 This week, we were treated to Boston College, my alma mater, and Wake Forest. Wake had lost nine in a row and BC was looking to snap a thirteen game losing skid, having not won since 2015. Somehow, it wasn’t. BC didn’t start playing basketball until about 13 minutes after the game started and things got ugly. It got as bad as 37-4 before BC had a “flurry” of scoring to finish the half with 14 points. The Eagles turned things around in the second half enough to save face to an extent, but the damage was done. Boston College lost three or four projected starters pre-season to transfers and the NBA Draft. Injuries have left them even more shorthanded, to the point that they are unable to compete in a power conference. They currently sit at 0-14 in the ACC, with a dismal KenPom ranking of 252. The list of teams ahead of them in those rankings is a real “Who’s Who” of basketball powerhouses: Houston Baptist, Incarnate Word, Mount St. Mary’s, UC Riverside, Canisius, Hampton, Samford. One team ahead of BC would be the St. John’s Red Storm, who have won once since December 14. The Johnnies dropped consecutive games this season at home to Incarnate Word (by 22) and NJIT (by 9). Luckily for BC and St. John’s, they are merely the second and third worst major conference teams this season, thanks to Rutgers. Oh, Rutgers. The Scarlet Knights currently sit at #294 in the KenPom rankings. They have five wins over Division I opponents this season (rankings in parentheses, out of 351 total teams): Howard (330), Central Arkansas (297), Central Connecticut (351), Fairleigh Dickinson (287), UMass Lowell (307). They have not won a game in conference play, and probably won’t. Rutgers is a Big Ten team who’s best win is over Fairlegh Dickinson. 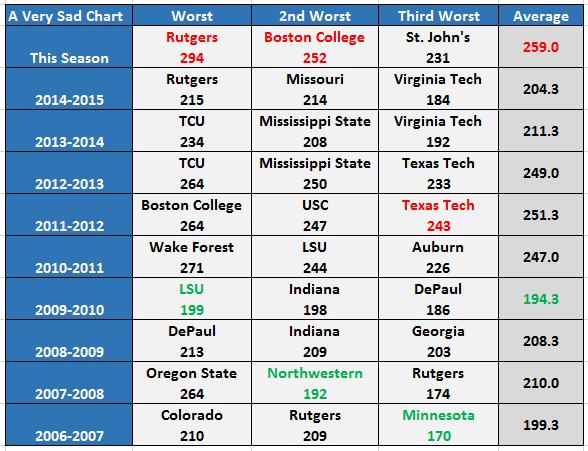 The trio of Rutgers, BC, and St. John’s may well be the three worst major conference teams in recent memory. To prove that fact, I scoured the KenPom archives to unearth the three worst teams from the six best conferences (ACC, SEC, Big Ten, Big XII, Big East, and Pac-12) from the last ten seasons. Rutgers appears there twice as many times as any other school. It’s not like the Jersey Boys have been killing it on the football field either. At a certain point, the Big Ten could consider giving the Knights the “Big East-Temple football” treatment, and kicking them to the curb. Sorry, Midwesterners. You could have had UConn. How sad are Indiana’s two appearances on that list? Few, if any, schools and fanbases care more about hoops than the Hoosiers. Thank God they are competitive again. Have fun with your East Coast bias, America! The Pac-12 drops just one team on that list of 30, the ugly 2008 Oregon State squad. This year’s mess is, statistically, the worst of the decade. So much of that is thanks to Rutgers’ troubles. On March 2nd, they’ll host Michigan State in Jersey, and I want so badly for them to win and inspire a court storming. Ole Miss’ Sebastian Saiz is looking good. Deal with it. Last week, we watched video of Bernie Sanders raining bank shots. Now The Guardian brings us a full rundown of his hoops past. Apparently he was sinking jumpers and tossing elbows back in the ’70’s. Palestra Back this week: You can read a lot of trade deadline recaps, but only one that discusses Pat Riley and his secret, greasy devil magic. And that’s right here at Palestra Back. More from me, at Rush The Court: Have your eye on an under-the-radar Final Four team? Here’s my take on the Dayton Flyers. Chris Ballard’s profile of Dirk Nowitzki over at SI is really great, because Dirk is really great. Kevin O’Connor from SBNation investigated whether Ben Simmons is shooting jumpers with the wrong hand…and found some pretty compelling evidence to back that theory up. Ian Levy of Nylon Calculus, a person smarter than all of us, ran the numbers and developed a cool way to chart an NBA player’s “3-and-D-ness”. If nothing else, it proves that Draymond Green and Kawhi Leonard are aliens from the future. Anyone not on board with the current cast isn’t watching the show. Ranking these from 3 to around 12 was really difficult. I love him going strong to the rim. Warriors playing in the East Coast time zone alert! ESPN’s Big Monday gives us two teams coming off of big losses (Miami got smoked by UNC and WVU blew their shot to beat Oklahoma at home) with a chance to right the ship…against tough competition. Gus and Raf on the call? Two top five teams? NCAA: Have you seen Cal or Utah play yet? They both play at 9 PM and are totally worth seeing before you fill out a bracket (vs UCLA on ESPN2 and vs Arizona State on PAC12 Network, respectively). I’ll be among the 300+ wackos in attendance for “Rights to Ricky Sanchez Night” at The (Wells Fargo) Center. The world’s most pro-Process podcast and the cult members who follow will be filling the upper deck and chanting the praises of Sam Hinkie.